Practically every terminal blocks� manufacturer already took over the technology and produces screwless terminal blocks and connectors. Our long-term partner, Euroclamp, is not an exception. In addition to the dominant range of traditional terminal blocks and plug-in connectors with screws, they also offer a basic range of screwless terminal blocks and screwless plug-in connectors. Screwless terminal blocks are from the MG1 series. They are produced in four pitches - 5mm/5,08mm and 7,5mm/7,62mm and in two versions - with and without button. All models are 45�angled. Versions with button need no screwdriver, but an unwanted push can release the wire. Versions without button need screwdriver, but there is no risk for unwanted release of wires. However, we have to admit that it is much more comfortable to push the spring with a screwdriver, especially at small pitch. If you need to bring many signals to a small PCB, we recommend using the multilevel terminal blocks. 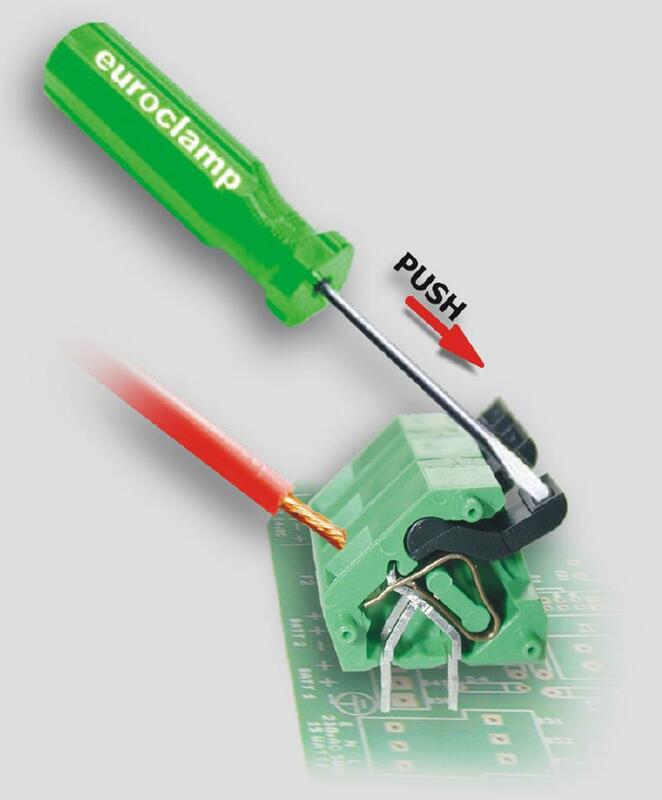 Euroclamp produces 2-, 3- and 4-levels versions (these are, however, only in 5/5,08mm pitch and without buttons). The maximum cross-section of wires is 1,5mm2 (max. current 16Amps) and maximum voltage is from 250V up to 750V. The MG1 series uses technology called �Spring Cage�. You have to push the spring to open the wire input. The SHM series connectors uses the "PushWire" technology, where solid wires and stranded wires with end-sleeves can be directly pushed into connector. Plug-in connectors are from the SHM series. That is the part of connection where the wire is connected. The counterpart is usually soldered into PCB - that is the PV series - it is common for screwless (SHM) and screw (SH, SV) plug-in connectors. The SHM series is available in 5 sizes - pitch 3,5/3,81mm, then 5/5,08mm and 7,62mm. All of them are available in version with flange screw (can we call them screwless then?). Those with 3,5 and 3,81mm pitch are a bit wider than "Nr. of poles x pitch". It means you cannot put them side-by-side. Two versions are available - F (in-line) - the wire is in-line with pin in counterpart. F versions are stock-types at SOS electronic. Second version is P (off-set). The wire is lower than pin and socket in connector. The maximum cross-section of wires is 1,5mm2 (max. current 8Amps) and maximum voltage is 160V. Those with 5/5,08mm pitch and 7,62mm are as wide as "Nr. of poles x pitch". It means you can put them side-by-side. There is also Modular version - two or more pieces can be connected into one block. The maximum cross-section of wires is 2,5mm2 (max. current 12Amps/15Amps) and maximum voltage is from 250V up to 500V.